Notice anything different about my pictures? You guessed it! I forgot my hairbrush at my mom's house. Oh, wait. Were we not thinking the same thing? 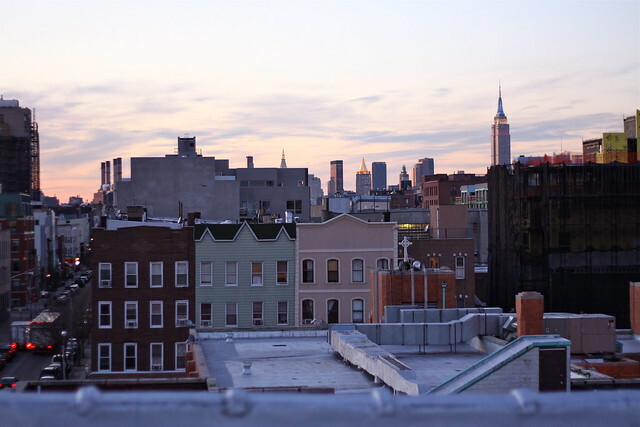 Here I am, camped out in Brooklyn for the week and its absolutely wonderful, especially the beautiful view of Manhattan. Today there was sun at the end of the day and the first hint of spring was in the air. Pink and green and floral felt perfect for the first time in months I'm not frozen solid in the photos. All I want to wear for the next few months is various shades of pink and green (just like the buildings in the background). The rest of this week should be interesting since I forgot half of what I meant to pack. Could that mean a good excuse to do a bit of shopping? that is such a beautiful skirt. and that time of afternoon gives the photos such lovely even lighting! Adorable! 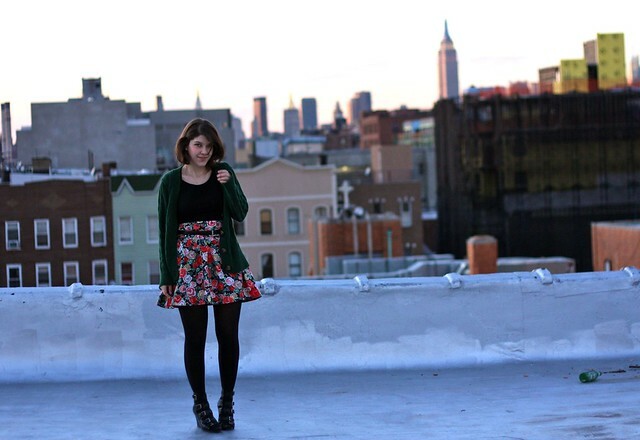 Makes me miss new york...sigh..
Love the sweater/skirt combo for reals. The skirt and shoes are super. And your backdrop is perfect. Amazing backdrop! This outfit reminds me of me-- a vintage outfit with modern shoes. WIN WIN WIN! That skirt is fantastic! Especially paired with that sweater. This background is amazing! 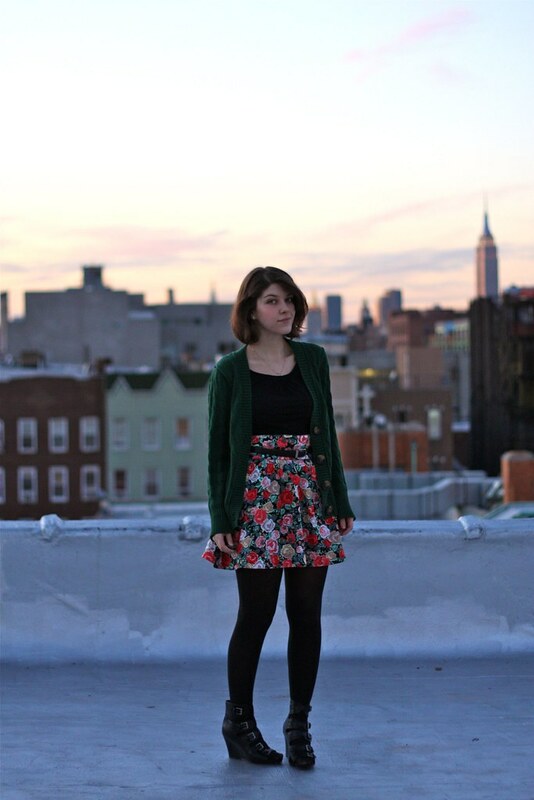 (Your outfit is super-cute too, I'm just stunned by the city-scape). I definitely have to visit Brooklyn when I'm in New York. So you're back from Turkey? When do we get to see picture of that? Lovely pics, such pretty light! What a tragedy about needing to do some shopping ;) Have fun! 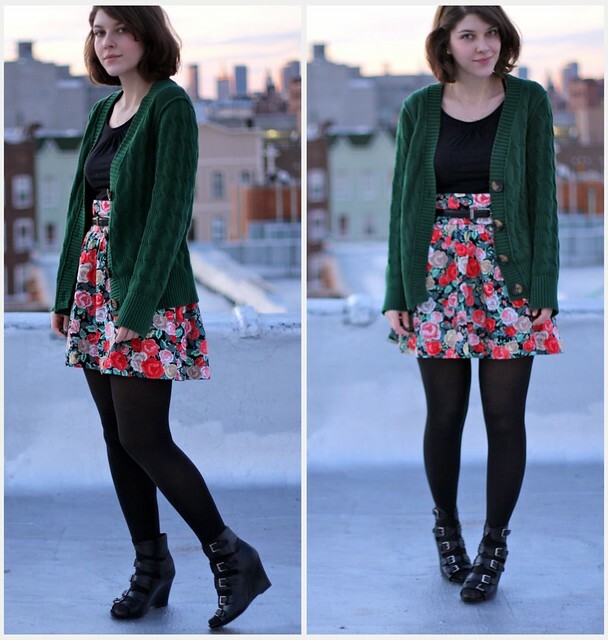 Pretty photos - I love your cardigan and wedges! GRRR stop making me miss the city so bad!!! I have to get down there for a visit soon. These shots are SO gorgeous. I love that skirt & I think green is one of the prettiest colors on you. your outfit and the photos are just awesome. so awesome. I dont even own a hairbrush anymore! I love that skirt! It's so bright and cheerful and will be great all spring and summer. I have serious spring fever right now, haha. How did you get the background so crisp in that first picture while you're so blurry? I love how it looks! 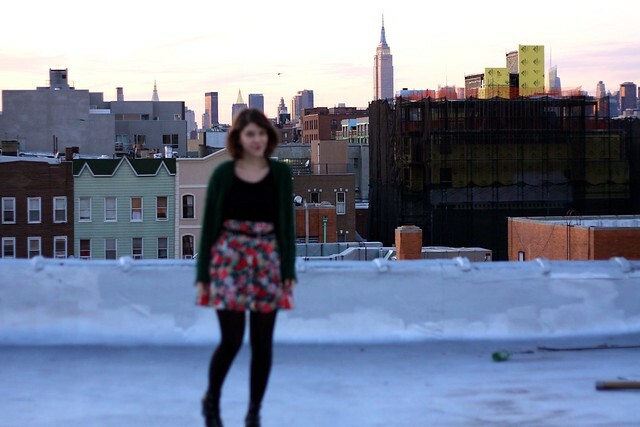 I love that first photo where you're out of focus and the skyline is crisp and clear. I also adore that skirt...it's perfect for March! the setting is incredible- a roof! the delicate air is beautiful next to the florals and green. your shoes are gorgeousss.